Do you wish to make your campaign standout during this summer promotions? Panic not start with these custom digital camo drawstring backpacks. These backpacks offer great visibility to your business message and reflect from long distance. It is perfect for promoting kid’s camps, summer events, youth festivals, beach festivals, safety shows and many others. Marketers seeking it for bulk gifting can avail it for best buy prices. Free shipping, free art setup and free online design proof can be availed for this backpack. 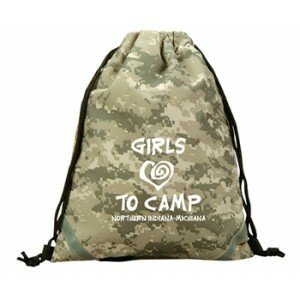 Request a quote to know bulk order discounts for these promotional digital camo drawstring backpacks. Features- Backside pocket perfect for ID cards. Edgy digital camo design. Includes reflective stripes. Item Size: 13" x 17". Imprint Size - 6"W x 6"H on front panel. Product Size : 13" x 17"